redoak was founded in 1996 as an HOA management company. In 2011 Steve and Nella decided to form their own real estate brokerage and turned to the redoak name for their company name. redoak Real Estate was formed as an entity of SteveNella LLC. redoak Real Estate has since grown to a real estate and property management company. It is family based and projects that value into the relationships that are formed with clients. 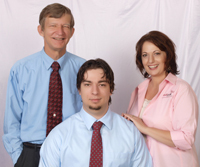 Steve, Nella, and Brian work together to make your dream of owning a home in the Killeen area a reality. Contact Red Oak Real Estate today for all of your real estate needs.